Users can record up to 12 types of thermocouples, 5 types of RTDs, and DC voltage/current input on one unit. The Fuji Electric PHL paperless recorder can literally record years of data with a 1GB (max) Compact Flash card. Free PC support software allows you to configure the Fuji Electric PHL paperless recorder from a PC and view historical data stored on the compact flash card. Fuji Electric PHL paperless recorders come standard with math and totalizing functions. Optional Ethernet communications allows for FTP transfer of files stored on the recorder’s Compact Flash card and for live monitoring of all inputs and alarm status via HTTP. The compact Fuji Electric PHF chart recorder is a 3 or 6 channel paperless recorder that displays data on a 5.7" STN color LCD. The Fuji Electric PHF chart recorder features a wide variety of display modes to allow users to view data as trends (horizontally and vertically), bar graphs, analog meters, digital/numeric output, totalized output, event summaries and more. 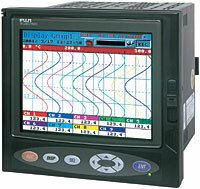 Switch between the Fuji Electric PHF chart recorder's display modes quickly and easily with the 8-key front panel. The adjustable-time screen-saver function extends the life of the display and reduces power consumption. Users can record up to 12 types of thermocouples, 5 types of RTDs and DC voltage/current input on one unit. The paperless Fuji Electric PHF chart recorder can literally record years of data with a 1 GB (max) Compact Flash card. Free PC support software allows you to configure the Fuji Electric PHF chart recorder from a PC and view historical data stored on the compact flash card. Ethernet communications are standard with the PHF and allow for FTP transfer of files stored on the Fuji Electric PHF chart recorder's Compact Flash card and for live monitoring of all inputs and alarm status via HTTP. 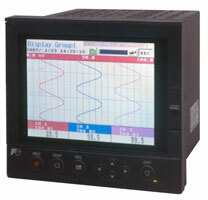 Fuji Electric PHF chart recorders include USB configuration cable, noise filter for the power supply, panel mounting brackets, and CD-ROM with PC support software and instruction manuals.